Events in Devon during June, the middle of the summer, Now you're talking!! Antique and Vintage Home Show 1st and 2nd June 2019. Westpoint Exeter. Torbay Airshow 1st to 2nd June 2019. Paignton Green. Free coastal airshow. The Smuggler Cycle Sportive 2nd June 2019. In aid of North Devon Hospice. Barnstaple. Online entry. The Contemporary Craft Fair 7th to 9th June 2019. Mill Marsh Park, Bovey Tracey. This event was a Gold Winner of the Visit Devon Tourism Award 2014!!! You can buy tickets on line. Ukulele Festival and/or other special events TBC. 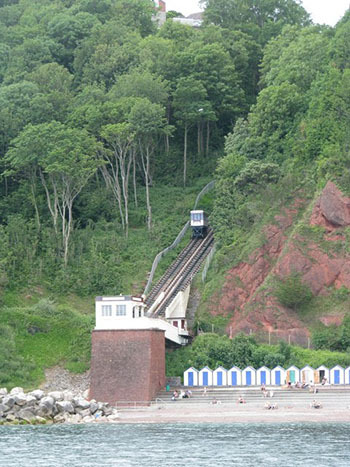 Babbacombe Cliff Railway. Free to enjoy. Ilfracombe Victoria Celebration TBC Days of festivities to celebrate Ilfracombe's Victorian past. Townspeople dress up and visitors are invited to do so also. Lots of fun. Occombe Festival 14th and 15th June 2019. Occombe Farm, Preston Down Road, Paignton. In aid of Torbay Coast and Countryside Trust. Bar, good food and entertainment. Teignmouth Folk Festival 21st to 23d June 2019. Several venues. Quite a time to be there. Shaldon Classical Music Festival 20th to 23rd June 2019. St Peter's Church. Four days of wonderful music. Torbay Half Marathon will be held on 23rd June 2019. Traffic Free. Get in quickly, this one is getting popular. Dartmoor Classic Sportive 23rd June 2019. It is a stunnin g ride. Ilfracombe with its magnificent cliffs is on the North Dorset Coast. This town is easily accessible by road and well worth a visit. 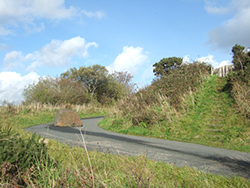 Hilly perhaps, but scenic and it is not surprising it is an Area of Outstanding Natural Beauty. If you are a wild life lover then this is a haven. Babbacombe is ideal for a holiday if you want peace and quiet but also the busy hotspots. The town is close to Torquay so it is the best of two worlds. The town sits high above the beach, but there is a cliff railway down which is fun for kids of all ages. Babbacombe is also famous for its Model Village. 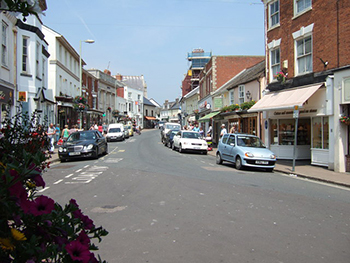 Teignmouth is on the northern side of the Teign Estuary. There is a ferry across the estuary to Shaldon on the southern bank. Teignmouth is the end or the start of The Templer Way an 18 mile footpath to Haytor. Whether one wants a beach or a quay Teignmouth is ideal. Paignton is on the southern coast and part of the English Riviera and all that has to offer - Blue Flag beaches, harbour, Zoo and the steam railway to name only a few! Dartmoor that wild, wonderful, mysterious stretch of moor that dominates that part of the county. Dartmoor ponies, Drake's Drum and Uncle Tom Cobbley of Widdicombe Fair fame. The fair still exists! there are fascinating walking trails across the moor, but care is needed as the weather can change quickly. See also Walking Trails in Devon for a few ideas. Barnstaple, a thousand years of history on the banks of the River Taw in North Devon. Some good boutique shops and there is a Pannier Market which opens six days a week. Bovey Tracey- Antiques Roadshow devotees will have heard of Bovey Tracey pottery, the House of Marbles is located on the site of that pottery. Riverside Mill is a contemporary crafts gallery. Shaldon on the Teign in South Devon is famous for its up market beach huts. Lovely safe beach. Why not try the local wine. Teignmouth to Shaldon Ferry operates every day except Christmas Day and New Year's Day. Bideford, a town in North Devon on on the River Torrdige. There are ferries rides along the river on summer evenings. Take a stroll along the quay. There is a ferry to Lundy Island. Anyone with events in Devon who would like to list their event here please contact us via the Feedback form, we would love to hear from you. The event should have its own website so that our visitors can find you and obtain more information. The events in Devon should be capable of attracting crowds, large village fete size and above, similar to those listed here. Posting events on this page is free. You may like to browse other pages on the site - please do. You will find buttons above on the left.